In general, it is a good idea to keep all of your code away from the timeline in Flash. To put it differently, it is a bad idea to write code on the timeline unless you really cannot avoid it. The main reason to avoid the timeline for code is that it is cleaner to separate your code from the more visual/animation-centric content that your timeline is really designed for. Code like this seems pretty harmless. 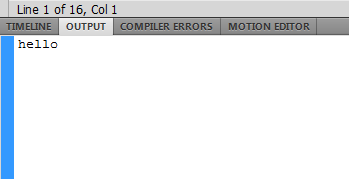 All I am doing is instantiating a class and calling a method in it - that's it. The downside is that this adds a certain dependency to the main timeline that makes maintainance and editing more difficult. 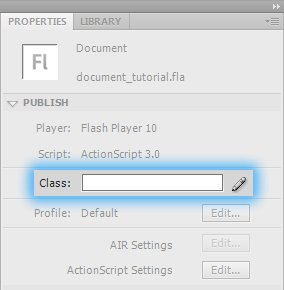 Fortunately, one of the features introduced since Flash CS3 for ActionScript 3 projects is the ability to associate a particular class with your main Flash document. This means that you can now have a class file (dubbed the Document Class) instantiated and called automatically when your application is run without you having to do anything extra, and this tutorial will show you how! First, go ahead and launch Flash. I'm using Flash CS5, but the instructions should be similar for Flash CS3 onwards. 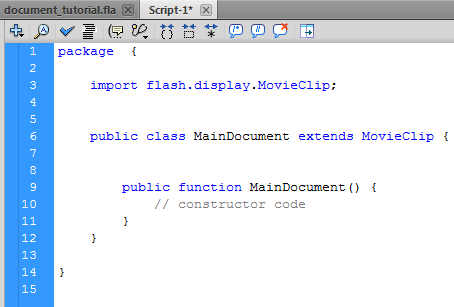 Once you have launched Flash, create new ActionScript 3.0 project. That's all there is to it if you just wanted is a class to get created for you automatically when you run your application. We don't want that for this case, because...well, what’s the fun in that? We want to see the code and make modifications to it! Before you call it a day and test your application, make sure both your FLA and this AS file are saved in the same folder on disk. By default, the ActionScript file that would have been created for you will be unsaved and unnamed. What you have just done is designated a class file as your Document class. As Borat would say, "High five!" 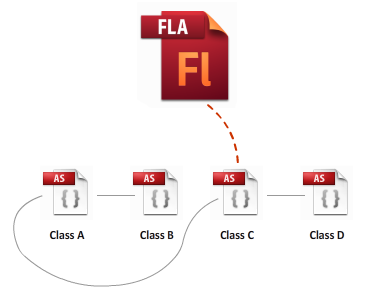 In the previous section, we looked at how you create a new class and have it be associated with your Flash document. In some cases, you may already have the class file you want to use already created. To associate an existing class file with your document, the steps are largely similar. Because you are associating a MovieClip (your main document) to the class, make sure your class extends the MovieClip type as shown earlier. Once you have done that, the constructor in your class will fire and everything will run from there. As long as your referenced class file lives in one of the known Source path locations and contains a class that extends MovieClip, you are golden...like a retriever! If all you are doing on the timeline is writing code to call another class file where all of your application's logic lives, strongly consider associating a class file with your Flash Document and have any relevant code there instead of in the timeline.